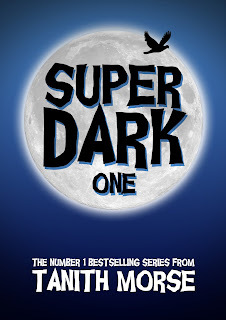 A Girl and Her eBooks: Super Dark 1 by Tanith Morse - FREEBIE!!! I glanced up from my book. The girl standing over me had a pleasant, open face, but I didn’t return her smile. She was the willowy blonde from my English class who sat two seats back. She wore way too much make-up and her roots needed doing, but somehow she made it look right. She’d tried to catch my eye a couple of times already, but I’d ignored her. If I’d wanted to make friends, I’d have spent lunch in the cafeteria with the others, instead of finding this nice, quiet spot on the benches behind the Science department. I was hoping not to be disturbed. Fat chance. “It’s George Orwell, Nineteen Eighty-Four,” I answered. I rolled my eyes. Who the hell didn’t know about the Thought Police, Big Brother, and Room 101? Had she been living on another planet? Undeterred, the blonde sat next to me. She smelled of soap and chewing gum. My stomach tightened. I knew exactly where this conversation was heading. It wasn’t fair. I’d only been at St. Mary’s High School a short time and already someone had recognized me. For a moment, I let the question hang there. Then I nodded. “Wow, I knew it!” she said. “Obviously, you’re a lot older now. But I could still tell.” Her face lit up with excitement. My mouth became a thin, tight line. I said nothing. My mind raced back ten years to a time when the world had seemed a safer place—a time before my innocence was cruelly shattered. I could see it all as if it were yesterday. Elliot Marsh had lived next door to me since we were toddlers. We’d attended the same nursery and primary schools, and our parents were the best of friends. He was the type of kid who’d take a punch for you, lie for you, or share his last Snickers bar with you. He seemed tough, but he had a big heart. If anyone picked a fight with me at school, I always knew Elliot had my back. I knew I could depend on him, no matter what. Elliot and I spent most summers together, climbing trees, having water fights, playing video games, watching cartoons, and teasing the neighbor’s dog. We even went to Disneyland together once. We had the kind of friendship that only comes around once in a lifetime. Neither of us could have imagined what was about to happen. The snow had come early to London that dark Halloween night, as Elliot and I started trick-or-treating on our street. We were both seven, but he was six months older. The two of us had felt so grown up dressed as Batman and Batgirl, trudging from house to house in search of candy. By the time we’d finished the rounds, our buckets were nearly filled to the brim. People had been generous—but I wanted more. “Let’s start heading back,” Elliot said. “What are you, a scaredy cat?” I teased. “No, I’m not scared of anything,” Elliot retorted. We took a left turn at the roundabout and started trudging up an unfamiliar street. Our boots, now ankle-deep in snow, made eerie, hollow sounds as they crunched on the pavement. We could see our breath in icy clouds. Suddenly, I felt an odd sensation, as if something had thrown a handful of wet leaves at my back. It made me freeze in my tracks. We heard the sputter of an engine—an old, tired sound, like the last chokes of a dying witch. We spun around and saw a battered, white van speeding in our direction, its headlights blinding us. When the vehicle pulled up alongside us, it screeched to a stop and an enormous man jumped out. He was the most hideous creature I’d ever seen: seven feet tall, with bloodshot eyes, dirty brown overalls, and a matted beard that hung down to his waist. His bushy brows met in the middle, and his neck and hands were covered in thick, black hair. His lips scared me the most: they were purple and punctured with teeth marks. What happened next was a kind of blur. One minute we were standing by the curb, clutching our trick-or-treat candy—and the next minute, this monstrous creature had scooped us up under his arms and shoved us into the back of his van. Candy spilled from our abandoned, overturned buckets, making a colorful stream in the snow. Inside, the van was dark and damp. The floor was covered with large clumps of hay, as though it had been used to haul livestock. The putrid smell of rotten meat was overwhelming. As the van rattled up the road, Elliot and I huddled together like a pair of scared rabbits, holding each other tight for comfort. I’ll never forget the warmth from his tiny fingers as they interlocked with mine, or the way he tried not to tremble for my sake. Elliot was putting on a brave face, but I knew he was just as frightened as I was. As my eyes grew accustomed to the gloom, I noticed we were not alone. Sitting a couple of feet away was a silhouette; when we passed a streetlamp, I could see it was a woman with swarthy skin and long, dark hair that was gathered back in two big bunches. She was dressed in strange layers of embroidered cloth that reminded me of a Russian Matryoshka doll. Chunky, gold bracelets weighed down her spindly wrists, and her calloused fingers sported an array of antique medallion rings. I gasped when I saw her eyes: black, unflinching, and potently evil. I burst into tears, and once I’d started, I couldn’t stop. I was terrified. Elliot cradled me in his arms, stroking my hair to make me feel warm and protected, but I could tell he wanted to cry, too. “What are you going to do with us?” he asked, trying to make his voice sound serious and brave. “I want my mum,” I whimpered. The woman folded her arms across her chest and glared in reply, her face as grim and impenetrable as ever. My sobs intensified. I believed now that we were going to die. This was it. We were Hansel and Gretel, about to be eaten by the witch. Abruptly, the woman made a violent stabbing gesture with her hand, and then she turned toward the driver. “Muzas gost!” she rasped. Her voice sounded unearthly. The man hit the brakes and the van skidded to a halt. The woman continued muttering in a strange, foreign language as she wrenched me from Elliot, unbolted the back doors, and shoved me out onto the street. The last image I had of my best friend was his sweet, tear-stained face, his tiny hand waving goodbye to me as the van doors closed. I never saw Elliot Marsh again. As I picked myself up, I saw that the snow had begun falling again. Huge, white flakes sifted down from a treacherous sky, like a terrible judgment from God. I glanced left and right, trying to get my bearings. I was in the middle of nowhere, miles from home, alone and terrified. The windows of the houses around me were dark and as empty as a skeleton’s eye sockets. I just stood there, frozen, not knowing what to do. Then, wiping my nose on my sleeve, I took a deep breath and started walking up the driveway of the nearest house. The old lady ushered me into her living room and told me to start from the beginning. I was talking so fast that everything came out in a jumble, but eventually, she got the picture. She phoned the police and reappeared moments later with a cup of hot cocoa. When I sipped it, I finally stopped shivering. Thirty minutes later, a patrol car arrived to take me home. As my parents comforted me, a detective took a detailed description of my kidnappers. I told him as much as I could remember. A nationwide search for Elliot was launched. The media got wind of the story, and before I knew it, my name and face were plastered all over the front pages. Everything just seemed to snowball from there. All the big news stations wanted a piece of me. I made televised appeals, posters went up everywhere, and hundreds of hoax sightings poured in. Our abductors were dubbed the Gruesome Twosome on account of their hideous appearance. At one point, a famous tycoon even offered a £50,000 reward for Elliot’s safe return, but it was never claimed. Despite an extensive search, no trace of my best friend was ever found. Without any new information, public interest quickly waned and the police had to admit that they were no closer to solving the mystery. I had missed a lot of school because of all the media attention, and everywhere I went, people recognized me. Kids pointed at me in the street while their parents shook their heads and thanked God I wasn’t their child. I felt like a circus freak. Broken and traumatized, I wound up seeing a counselor every month until I was twelve, to help me cope with the situation. I was diagnosed with anxiety and depression. I had trust issues, insomnia, a fear of large crowds, and a dozen other problems I was barely even aware of. Then, when I was fourteen, things got worse. My parents divorced, Mum was given custody, and we spent the next couple of years living like two hobos, moving from place to place and trying to make ends meet. Mum took what temp work she could to pay the bills and keep a roof over our heads, but nothing was ever permanent. Nowhere felt like home. I lost count of how many times I had to change schools. We were always on the move, always on the run, but the past was never far behind us.